Discover the journey of Ed Grothus, from working in Los Alamos National Laboratory in New Mexico to becoming an outspoken antinuclear activist. 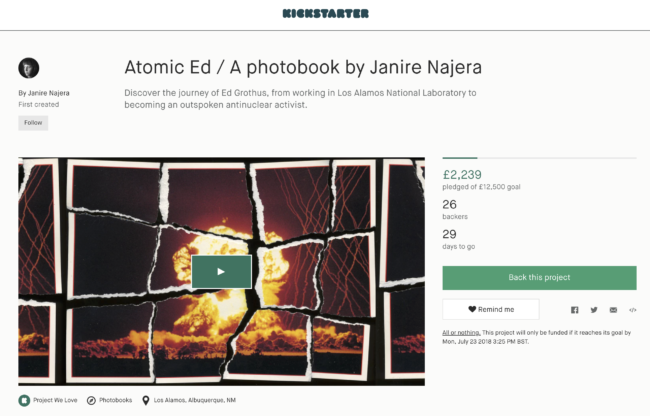 Archival documents, past and recent photographs and a selection of letters from over 50 years of correspondence between Ed Grothus and politicians, scientists, the media and his family take us back and forth through the nuclear history of the USA. Atomic Ed has already been designed and is ready to go to press. This Kickstarter campaign aims to raise the funds to cover the production costs and shipping expenses of this photobook so I need to pre-sell around 400 copies to make it possible. You can visit the kickstarter campaign by clicking on the image below or this link. Hope you can help me spread the word or pre-order a copy, your suport will go a long way!